Hola! Bienvenido Aquí, I hope you had a good month. July is almost over so it's time for July Favourites! In the makeup department, July has been pretty quiet. I only picked up a few drugstore things. They are budget friendly options. 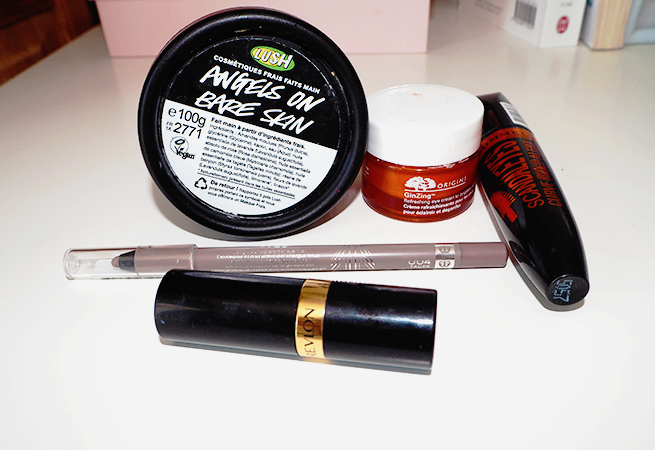 It’s very beauty on a budget this month ahah. So I got first the mascara from Rimmel. Its price totally convinced me and it's pretty good as well. I also got a long-wear Sacandal eyes waterproof eyeliner in the shade 004 taupe. I also bought the ScandalEye Mascara. I bought a lipstick. It is the PINK IN THE AFTERNOON (415) Superlustruous Lipstick from Revlon. It stays on for about 2 to 3 hours. And at last, my everlasting favourite is the ANGEL ON BARE SKIN cleanser by Lush. It's my all-time favourite! It is a must have for my sensitive and complicated skin type. It doesn't irritate my sensitive skin, nor make it look red. The smell is fantastic!